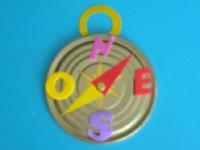 Children will love to explore your yard with this colourful compass. 1. Gather your material. 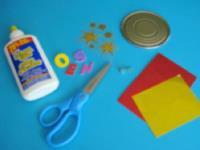 You will need the top of a metal can (28 oz), adhesive foam letters (N, E, S and W to represent the cardinal points), heavy red and gold cardboard, a large star-shaped sticker, scissors, a hole-punch (not shown), a fastener, as well as white and/or hot glue. 2. 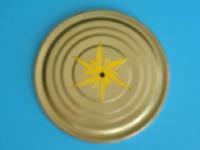 Glue the star-shaped sticker in the centre of the metal lid. Using a hammer and nail (or an electric drill), make a hole in the centre of the lid. Of course, this step must be done by an adult. 3. Cut an arrow and a circle (with the centre cut out) out of the gold cardboard. Cut a second arrow out of the red cardboard. 4. 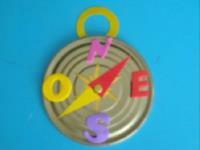 Glue the letters representing the cardinal points on the metal lid to represent a compass. Provide a model and let older children try to place the letters in the right spots on their own. 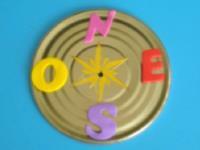 Name the letters and explain how they represent North, East, South, and West. 5. 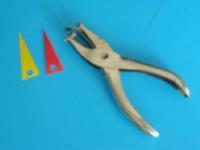 With the hole-punch, make a hole in the arrows as shown. 6. Secure the arrows in the centre of the metal lid with the fastener. 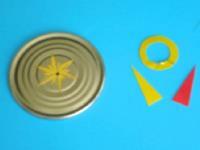 Glue the gold loop at the top of your compass to represent a handle. Your explorers are then ready for their first adventure!